The word grassy means covered with grass. I’m so certain of that, I didn’t even bother to look it up. The word knoll refers to a small hill. I did check that one. There doesn’t seem to be a precise definition, however. No minimum or maximum height or diameter, for example. No size requirement at all. I could build a knoll in my backyard with a shovel and a few hours of pointless labor. Imagine, then, how many grassy knolls there are in the world. There must be millions of them. But for an entire generation – people my age and just about anyone older — the phrase grassy knoll brings to mind a specific time and place. The effect is immediate, and unavoidable. It was Friday afternoon, November 22, 1963. The weather was warm for a day so close to the start of winter. I was in the third grade. We were back from lunch and getting ready to go home for the weekend. Looking ahead, the following Thursday was Thanksgiving, and when we returned to school after that, we’d have already begun to nibble our way through December, and toward the long Christmas break. It was one of those perfect spots of childhood, from which so many good things could be seen right up ahead, and almost within reach. There wasn’t much we could imagine that would spoil the feeling. Then the principal’s voice, blunt and muffled and crackling, broke into our happy dream world to tell us that John F. Kennedy had been shot in Dallas. She returned soon after to let us know that the president was dead. I want to say that we were shocked, and I suppose we were. But it had already been a shocking year, and we were somewhat accustomed to unthinkable news. In May, the monsignor of our church had passed away. Monsignor was our leader, the most blessed man we knew, someone who could elicit gentle smiles and reverence from the grouchiest of nuns. I’m pretty sure his had been my introduction to death, and to the stark truth that no one was immune. A month later, Pope John XXIII died in his bed at the Vatican, something I hadn’t even thought possible. The pope was almost God, I believed, a person surrounded by enough prayer and statues and holy water to protect him from mortal menace in all its forms. Still, he’d lived eighty-one years, an incomprehensible span for those of us who hadn’t yet completed our first decade. The pope was older than my grandmother, and she was ancient. Then, in August, the president’s infant son was born, premature, and survived just a few days. It was becoming clear that neither age nor position could prevent or delay the inevitable end of life, and that our human perception of fairness had nothing to do with it. For some reason, though, the assassination of JFK was different. Those other deaths had been large and fuzzy, like a strong wind that blows through and then disappears. The news from the classroom loudspeaker on the twenty-second of November was more like a tornado. We could see it, watch it move slowly across our television screens, and examine the destruction it left behind. For young children now familiar with air raid drills and the impending horrors of nuclear war, the murder of the president also demonstrated how flimsy and porous our security really was. Whether or not we wanted to acknowledge it, we were all riding in the back seat of an open convertible. And no matter how many loving faces there were, beaming at us from the crowd, a single disturbed mind – or a small, conspiratorial group with evil intent — could produce immeasurable damage. This is a lesson we’re still learning, a half-century later. The events of that day, the spectacle of the next week, and the lingering sadness that seemed to seep into every pore of our existence, all served to remind us that everything had changed. Even our language. I can’t hear the words motorcade, depository, or plaza without being snapped back to that moment in 1963, and to the man whose body now rests beside a grassy knoll at Arlington National Cemetery. It was a Friday afternoon. The weather was warm for a day so close to the start of winter. Many good things could be seen, right up ahead, and almost within reach. 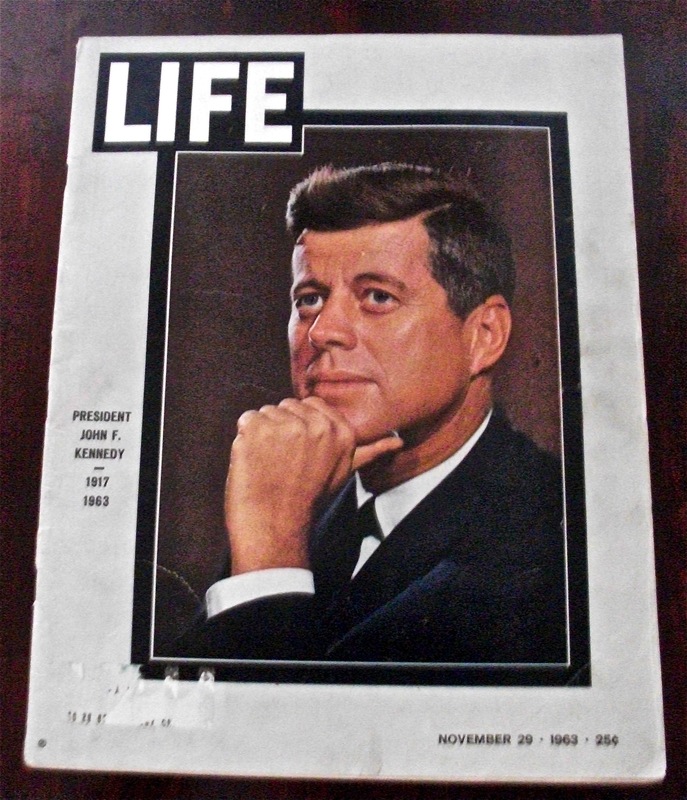 I actually have those copies of LIFE after his assassination – I was only a year old, but mom saved them all. Though I don’t remember that time, you perfectly described how I felt when we heard about the WTC….you could almost feel the plates shift and the time-quake begin. Amazing blog as always, Charles. I have those same magazines, Ashley. In fact, I took that picture this morning. I also spent time reading some of the articles in that issue, and others, and was surprised to see how much of the discussion we have today about the assassination was already taking place very soon after the event. For all of our computer animations, sophisticated equipment, and expert analysis, it’s still hard to know exactly what happened. It is always a pleasure reading your post. It’s written so well,even though it’s long I cannot stop until I read every single word with care. I feel the emotion and visualize the event that happened so many years ago,yet it seems it was only yesterday we heard about it , You have that power. Best wishes to you and keep writing for we all love reading your posts. Thank you for your kind words, Ranu. Linda, I’m not sure if it’s more true today than it was back then, or if we’re just more aware of things. But our capacity for hurting each other seems to be showing little sign of diminishing. Thanks for such a lovely post. I was just an infant when Kennedy was killed, so I remember nothing. However, I’m so happy to read about the event from your perspective. You have given me insight I didn’t have before. I appreciate that–and how well this piece is written. The images are easy to find, Kathy. The facts — and the accompanying emotions — are a little more elusive. But just ask anyone born before 1956, and you’ll hear a story. A powerful piece, Charles! Beautifully written. Thank you, Diane. I’m glad you liked it. Thank you for another beautiful, thought-provoking post, Charles. I was only three at the time, so I’m pretty sure that whatever vague memories I have are more likely connected to the television replays over the years. What a tragic time for our nation and our nation’s school children–and how sad that, yes, 50 years later, we are still learning that “a single disturbed mind – or a small, conspiratorial group with evil intent — could produce immeasurable damage.” The only difference is that now the disturbed and the evil choose not just one man on a grassy knoll but 26 little ones in a Connecticut elementary school, 12 movie-goers in a Colorado theater, 32 students on a Virginia college campus–and almost 3,000 citizens in New York and D.C. structures on a warm September day. It’s getting harder to see all those good things up ahead. Karen, you just made me recognize the contrast between the JFK assassination and all of the horrible events that have taken place over the past twenty years. There have been so many — and I’m only going back to the World Trade Center bombing in 1993 — that they don’t stick in our minds the way we think they will. I recently heard something about the snipers who were terrorizing Maryland and Virginia in 2002, and realized that I’d nearly forgotten all about them, and the thirteen people they shot over a three-week period. I guess we aren’t as stunned as we used to be, and the details, or even the events themselves, are soon forgotten. The only thing I remember from that time was seeing mom watching the funeral on TV. I was only 4 1/2 at the time, so I was oblivious to most things. I have never seen the movie JFK, but just recently watched the movie “Killing Kennedy”, based on Bill O’Reilly’s bestselling book. I am ashamed to admit that I had NO idea who Lee Harvey Oswald was (other than knowing his name) and no clue as to what would have driven him to want to kill the President. I’m still not sure which version of events I believe, but I do know that having the President murdered, whether you like him or not, is a terrible thing for the country. I know it changed so much, just as 911 has in recent times. It’s very sad that anyone, anywhere, feels that they have to murder other humans, to advance their agenda. It’s the part of free will that I really don’t like. I agree, and I think most people do. It was easy to feel the nearly universal response when Reagan was shot. A democracy allows for strong differences of opinion, but no one wants to see a leader removed with violence. That isn’t how it’s supposed to happen. Thanks, Cecilia. I appreciate the comment. Brilliantly written. If I was in charge of Freshly Pressing, I would Freshly Press this! It was seven years before I was born, and I’m British, so the closest thing I can relate to it was Princess Diana’s death (although I was actually living in the States for a few years when that happened! ), and of course 9/11 as others have mentioned. Events that rock the world and change it forever in some way. It’s interesting that Diana’s death spawned similar conspiracy theories. It’s also interesting that when the assassination attempt fails –as with Ford, Reagan, Wallace, and others — those theories almost never appear. I give you credit for taking on this topic and writing so beautifully about it. There are some incidents that leave me without words to express my feelings. This is one of them. I debated with myself for a long time, Ronnie. The Kennedy assassination is one of the most written-about events in history. I wondered if there was anything left to say. Everyone is right; it’s not just the subject matter but how well you crafted it with words. Thanks. Great blog, by the way. I remember that day as though it was yesterday. My perception mirrors yours with the exception that I was in grade 5. It heralded a loss of innocence never to be re-captured. I agree about the loss of innocence. I sometimes wonder how much of the turmoil of the 60s would have been avoided if Kennedy had survived. The widespread distrust of government seemed to increase dramatically after the shooting. Along with it, we got protests about the war, race riots, more assassinations, Watergate, and a lot of violence and disillusionment. I wasn’t born until 6 years later, and somehow, having grown up in a hippie-culture home, JFK was more than an icon, he was a legend. Every adult in my family remembers exactly where they were when they heard the news. This one event was of such an influence in my life in spite of not even being born, that the words “grassy knoll” transport me in the same way they do those who were alive at the time. Great post. Danielle, it continues to amaze me how individuals can feel completely powerless, and at the same time, have it within their grasp to cause so much heartache with a single act. I don’t know if Oswald was working alone or part of a group effort. Either way, the effect seems out of proportion. IT’s sad that our lives are so changed when something like JFK’s murder changes one’s world. (I was in third grade in a Catholic school). It truly shifted my world, and my visions of it. Just like 9/11/2001, when I was at work, and, checking the news on my computer, saw the unimaginable images of the Twin Towers burning-in both cases, one struggles to make sense of it. What worries me, though, is you ask some young kids…teenagers… if they know who JFK was. I had one tell me, wasn’t he the one on that old fashioned coin, the fifty cent piece? You wonder, what in the hell are they teaching in schools anymore? I mean, is it vitally important that a child growing up learns that an evil man murdered a president? Yes, just as it’s vitally important that a child learns that an evil man and his henchmen murdered over 3000 of my people. For no reason other than they could. I guess we can always point to significant events and ask what might have been. But in the case of Kennedy’s death, it seems indisputable that much of history, from 1963 right up to today, would have been very different. We just don’t know exactly how. Third grade. Catholic school. Hey, was that you kicking the back of my chair? I wouldn’t have dreamed of it. I think you were the boy I chased during recess. Oh, wait, no, that was Dan Brinza. I wanted to kiss him!! Holy cow could that boy run…. I too recall the day vividly. Second grade for me, we got out early, and my brother, my hero was crying and I couldn’t make him stop. Whenever I think of that day, I am also reminded of the comment Kennedy once made that everybody knows where they were when FDR died. And everybody remembers where they were when Kennedy died. And of course there were others that followed: MLK, RFK. And I always lump John Lennon in there too, although it was a different decade (but he was part of the 60s, no matter what). And the Challenger explosion had a similar effect, I think, a little more than twenty years later. I remember my sisters talking about how they were in school ,as well, when the news of Kennedy’s death was announced and how it made them feel. I come from a family of ten, so the siblings ranged at that time from infant up to high school age. I was born 3 years later. Nice tribute and as always wonderfully written. Thanks for your thoughts, Rachael. For anyone who remembers it, Kennedy’s murder was one of those experiences that feels shared, even though most of us have no other connection with each other. Showing yer age, sugarpie! lol. I don’t really remember any shocking news like that throughout my lifetime. Well, maybe the terrorist attack on the Twin Towers – I sat infront of the telly bawling my eyes out all day watching that. But your point that it was a lovely day rang home. Throughout my working life, I have lost probably thirty or more colleagues (goes with the industry, I guess… working with mostly old farts). I do recall a couple of deaths being on the most glorious sunny, yet temperate, days thinking “it’s a beautiful day to die” in a rather sardonic fashion. Yep, no one is immune to the Grim Reaper. Adding to the shock, I think, was the fact that it had been a long time between presidential assassinations — more than sixty years. For most Americans, it was something they had never experienced before. Thanks. Were you a senior in high school at the time? Great job, Charlie. I remember that Sr. Georgiana came over the loudspeaker and said that “the President and the Governor of Texas have been shot”. I turned around to the kid behind me (maybe it was you) and said, like a dumb 8-year-old, “The President of Texas has been shot”. Most of our nuns were Irish-Americans, so they were particularly grief-stricken. The world did change that day, and it seemed that the forces of darkness had taken over. As kids, we didn’t realize that these forces are ever present and just manifest themselves differently from one era to another. As a foolish young man, I would try to enlighten people about the Kennedy assassination. Now I realize that to understand the JFK assassination and its aftermath is to understand how the world works, and has always worked. It’s right there, in plain sight. But people have to decide for themselves whether or not they choose to see it. Just as vivid as Sister Georgiana’s announcement was Andrew’s immediate reaction. He was seated directly to my left, and when I looked over at him, he clenched his fist and said, “I’m going to kill every one of those Dallas Cowboys!” I wonder if he remembers that. Your post made me tear up … which is still, mysteriously, my reaction to that unforgettable Friday 50 years ago. When my whole family watched the funeral, on our little 12″ TV, it was the first time I saw my dad cry. When RFK was assassinated just a few years later, it was the second time. I’m guess for our kids, it will be the memory of 9/11. My daughter was in 5th grade and I’m sure seeing all the adults so grief-stricken, and all those images of the towers falling on TV, over and over and over again, creates the kind of grief memory that stays with you a lifetime. Still makes me so sad …. Some events affect us on individual and specific levels, while others seem to pierce through every layer. The assassinations of the 60s were like that. And while all of the mass shootings of the past two decades have been horrible, I think the massacre in Newtown will be the one people continue to talk about. September 11 is in a category all its own. Though I wasn’t born yet when Kennedy was assassinated, my generation has definitely had its share of tragedy. I was a fireman on duty the morning of 9/11. I can still vividly recall making it back to the station that morning after a call and watching the second tower crumble to pieces. Silence, and especially tears is a rarity around the firehouse, but on that day nothing was held back. Sadly, tragedy will always follow the living. Let’s just hope it doesn’t cross the threshold into death. Chris, I worry that your generation will become desensitized to this kind of tragedy, just because it seems to be happening much more frequently. I’ve noticed that I don’t react with the same shock when I hear about another school shooting. That kind of complacency is not a good sign. On the other hand, can we live our lives in a constant state of outrage? A beautifully written piece Charles which puts into perspective so well the simple confusion of childhood, when we felt the adults were the ones who had it all together and, if we were lucky enough, one day we might grow up to become the giants they were. It was heartbreaking to see heroes fall. I am quite sure we said a special Rosary for JFK as indeed we did for RFK. They were like uncles in the family, Jackie was definitely an aunt! That’s a great point, Patti. Most presidents before Kennedy — and most since — have seemed distant and hard to relate to. His was like a death in the family. Childhood is that phase where immense enjoyment is gained from the smallest of happenings. A tender phase that is. And the type of trauma you had encountered with JFK’s assassination was well described. A tender phase, and one that flies by almost before we know it. Beautifully written, Charles. My Mom called me at work to tell me about John F. Kennedy’s assassination. I wasn’t old enough to vote then. I recall watching the coverage of Lee Harvey Oswald and saw Jack Ruby kill him, I questioned how Ruby had the access he did and why they trotted Oswald out so often before the cameras. Kennedy’s death was a loss of innocence … and my disillusionment with politics. A tragic time. Just what might have been? It is odd to watch the footage and notice how many times we see and hear Oswald in a two-day period. That would never happen today. There was a film called The Trial of Lee Harvey Oswald. Fiction, obviously. We can only wonder what the real trial would have been like. For me this was the beginning. Soon after came Robert Kennedy. Then Martin Luther King, Jr. I remember when the Munich Massacre occurred in 1972, I was despondent, realizing that my children were being raised in a totally different culture than I had experienced…due to violence and/or mass media coverage. I don’t know how you would figure out such things mathematically, but I sometimes wonder if the increased violence we think we’re seeing is just a reflection of the growth in population. The number of people in the world has more than doubled since 1963. And our ability to know about events has risen dramatically, so our awareness is also heightened (although our attention span and memory seem to be weakening). In the second half of the nineteenth century, three US presidents were assassinated in a span of thirty-six years. How would we react if that happened today? I just wonder which is the cause and which is the effect. Violent people may enjoy watching violence, but millions of others are watching it, too, without resorting to the behavior they’re seeing. Fiction has been portraying evil actions for thousands of years. The live games and entertainment of ancient Rome were horrific, and real. But I’ve never heard or read anything to suggest that spectators went out and tried to mimic what they saw, either on stage or in the amphitheater. Then again, maybe it’s the frequency and graphic realism we experience today that has pushed some individuals over the edge. I wish I knew. We have had several of those “moments” of morbid clarity in our lifetimes. I know that in addition to JFK, Challenger and the events of 9/11 are clearly moments that most North Americans can pinpoint exactly. I wondered, living here in the land of Mao, which moments my new neighbors remember with such clarity. Not surprisingly, 1976 is high on their list of ‘Moments”, Mao died in early September and the Tangshan earthquake in November thrust the country into the dark ages. Not surprisingly I don’t remember either of those moments. Our Chinese friends do remember 9/11 much like we do, there are not many of those uniquely “universal” moments. I imagine that with the connectivity we have today and continue to increase that we will see more of those universal moments. Moments that are life changing for everyone while notoriously bad, they are also moments that will hopefully draw us closer together through shared struggle and the will to continue on and overcome. I imagine we all tend to remember the things that hit closest to home. I’m often surprised when I read about some huge catastrophe in which many thousands of people were killed and injured, and I either don’t remember the event or never knew about it. A universal moment would have to be something that affected everyone, like an asteroid strike or an alien invasion. I wonder: could there be a positive universal moment, and what would that look like? The Nuns taught at least one. Of course, even that day was called in the great and dreadful day of the Lord (Malachi 4:5). So it would be positive for some and dreadful for others. Here’s to hoping we get the “great” version of that day and not the “dreadful” version. Your writing is so vivid, it made me feel like I was there. I’ve been watching loads of coverage about the anniversary this past week and had no idea Jackie had just lost an infant a few months before she lost her husband. I am in awe at her strength during that time. And I suppose it really was the end of innocence for a lot of people that year. They were both devastated by the baby’s death. And both had an amazing ability to appear brave and in control, at least in public. Very well written, Charles. I was in first grade and if there was an announcement at school I don’t remember it. When I was standing in line for the bus to go home, two boys from another class started laughing about the president being shot and began to pretend to shoot each other with their fingers. The bus driver got off the bus and reprimanded them severely for being so disrespectful, and for making fun of something so tragic. I don’t think I even knew what a president was at that tender age, but the reactions of the adults around me gave me the feeling that something unbelievably horrific had occurred. It’s hard to appreciate an event of that magnitude when you’re six years old, Barbara. I don’t think I remember a single thing about Kennedy’s presidency. It was the shock of his death that made the impression — and as you said, the feelings expressed by the adults around me. Charles, a lovely post, so beautifully written. I remember crowding around the television, my mother sobbing, and realizing that something had changed. A lot changed, Catherine. No one knows what would have happened, and not happened, if Oswald had missed. I’m sorry I did not read this in a more timely fashion, Charles. It is a beautiful tribute to the day and how vivid our memories of it are. I confess I was emotionally overloaded with posts that came into my mailbox on the 22nd and with the coverage on the TV. This day had some of the strongest memories of my Mom attached to it. I had never seen her cry. She wept openly and it was a day we stayed together, close, in one room. So many families did. Those words you mention are innocent in their own right but you are correct, they can bring us right back there before we can even breathe. It’s also interesting how drawn we are to anniversaries that involve a multiple of five. There’s a November 22nd every year, yet most slip by with barely a mention of the assassination. I doubt your mailbox will be flooded next year, Michelle. You are probably right. Now that I think of it that hasn’t happened before for that occasion. Thanks, Ann, for reading and commenting. It is perhaps a sad comment on my alienation and disconnection from the world that I don’t recall it at all (and we are, I believe, the same age). But then I don’t really have any sharp memories of my past… I just don’t seem to carry it around with me as most folks do (and on some level I’m envious of the ability). I may have my quirks and flaws, but I seem to be entirely baggage-free. The future is filled with possibility. Aliens could land. Cancer could be cured. The National League could adopt the Designated Hitter rule! I can’t believe you have no sharp memories. What about the 1991 World Series? I have some vague memories of 87. I’m serous in that I don’t retain things; I just don’t. I’ve re-read books in my library many times, and each time is close to new. Bits come to mind as I read, “Oh, yeah, I remember that now.” I’m a bit better with movies, but I’m definitely not one to recognize quotes, actors’ names or scenes. There are some exceptions, but that’s the rule. High school? An almost entirely closed book to me. Prior to that? Hazy occasional memories. After working at TC for 33 years, I would run into people I apparently knew well at one point. I feel like a youthful Alzheimer’s patient sometimes, but it’s been like this all my life. It was a long time ago, and for most people in the world, it happened in a far-away place. Unfortunately, so many similar events have occurred that most people can relate to it in some way. Thanks, as always, for the kind words.